By the 1920s Casa Gonzáles was one of the most prestigious ceramic firms in Seville. They did much of the tiling for the Plaza de España and the María Luisa Park, the site of the Ibero-American Exposition of 1929 held in Seville. One of the Gonzáles brothers, Don Aníbal González, was the architect for the Plaza de España, where he combined a mix of 1920s Art Deco and Neo-Mudéjar, neo-Moorish, styles. 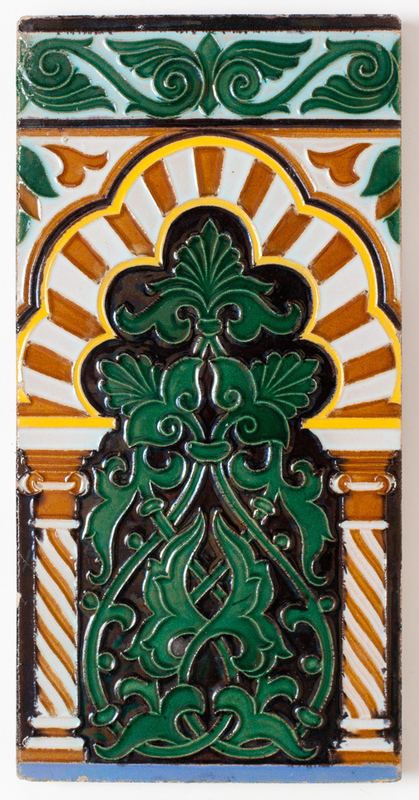 Tiles were used extensively for the alcoves, fountains, walls, ponds, benches, and more. 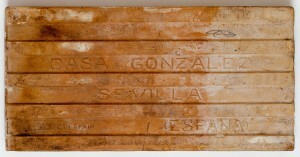 The company issued at least two catalogs in the 1920s: Catálogo de Azulejos de Estilo Sevillano and Catálogo de Azulejos de Estilo Moderno. A library at Harvard has both, and I am hoping to get my hands on them to see if my tile is listed. The tile is in perfect condition for its age, with a couple of superficial nicks around the borders. Dimensions: 10 3/4" x 5 3/8"